Mischievous melody makers The Horne Section take their chaotic show back on tour from the 8th September to 30th May 2018, a typically unpredictable run which includes a welcome return of their Soho Theatre residency in London. The Horne Section is where music and comedy collide creating a show packed with brass based fun. Expect toe- tapping tunes on weighty issues such as beards, caveats and Scottish widows. The Horne Section have enjoyed numerous sold-out runs at the Edinburgh Festival Fringe as well as at The Lyric Theatre – Shaftesbury Avenue, The Criterion Theatre and The Hackney Empire. Away from the stage they have hosted three series of the successful Alex Horne Presents The Horne Section (BBC Radio 4), regularly appear in dictionary corner on 8 Out of 10 Cats Does Countdown (Channel 4), and were the first ever band to host an episode of Nevermind the Buzzcocks (BBC Two). 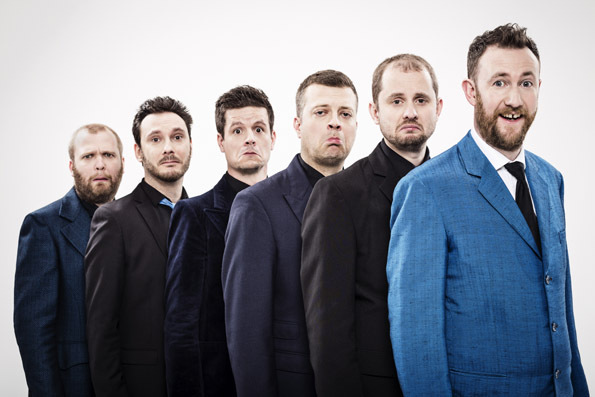 Acclaimed comedian Alex Horne is the unlikely band leader at the helm of The Horne Section. Alex is the creator and co-host of the BAFTA, Royal Television Society, Broadcasting Press Guild and Broadcast Award nominated show Taskmaster on Dave which returns for its fifth series on September 12th. The show has been licensed to numerous territories around the world, and a US version, with Reggie Watts (The Late Late Show with James Corden) taking on the role of Taskmaster has been made for Comedy Central. Alex is also an Edinburgh Fringe veteran taking nine solo shows to the festival and earning an Edinburgh Comedy Award nomination in 2014 following a Best Newcomer Award nomination in 2003. The Horne Section are: Alex Horne (band leader), Joe Auckland (trumpet and banjo), Mark Brown (saxophone), Will Collier (bass), Ben Reynolds (drums and percussion) and Ed Sheldrake (keyboards).